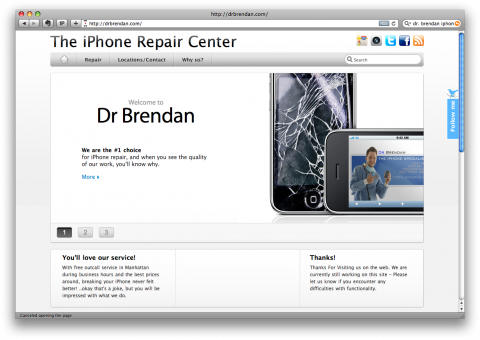 Brendan is a charming young guy, who kinda fell into this and is now making a living off fixing iPhones. My phone looks like new, works like a charm and it cost me a mere $70. Brendan does house-calls and meets you pretty much anywhere in the city. Does it get any more convenient? Nope. I can’t recommend Brendan enough. I was disappointed though that he didn’t wear scrubs during the surgery. Ha! How was he able to replace your glass for $70 that is cheap. Ive had my screen replaced by him as well, it looks brand new. Only took him 20 minutes, too! What a fantastic entrepreneurial idea! Kudos to Dr. Brendan! Beautiful! Funny that I found this just now… my boyfriend made an attempt at fixing my shattered glass and he broke my LCD. We called Dr B, and he came over to finish up the job. Phone looks like new! You’re very right about that Alissa – in fact, we are adding mail-in functionality to our site at this very moment. It should be up by tonight or tomorrow. I appreciate all the great feedback from everyone! !